"Gus Szamboti Cue: SW 19.6 oz. 3 original shafts: 2 are 12 3/4 mm in very good condition; 1 is 13 mm in very good to excellent condition. This particular cue is very rare for several reasons. The cue is all original, meaning that Gus Szamboti is the only cue maker to do any work on this cue. The shafts, finish, and leather wrap (rare) are all original. To my knowledge, Gus made very, very few cues with purpleheart prongs, making this cue extremely rare, Over the past 15 years, I've seen less than 5 cues. Also included is an original shipping box from Gus. 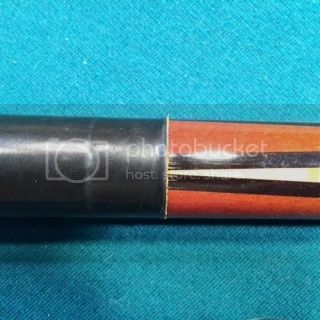 The original owner of this cue was a well-known player in the Massachusetts area. The value of this all original Gus Szamboti cue with 3 shafts and original shipping box is $6000.00 - $6500.00" - Pool Table Magic (Mark Kulungian) - April 1, 1999. Cue has not been played at all since I purchased it.